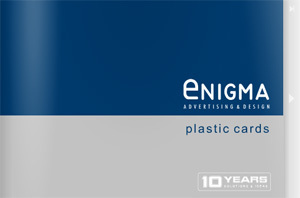 Enigma Advertising is a leading supplier of plastic (pvc) cards. Based in Cyprus, we supply cards to a wide range of companies based in Europe and across the World. We produce membership cards, discount cards, scratch cards, key fob cards. Matt laminated cards, plastic business cards, magnetic cards, smart cards, hologram cards and more! We offer a wide range of Plastic Card manufacturing, printing and fulfillment services. Whether you are looking for a plastic business card, Photo Identity card, gift, membership or loyalty card, we are here to help. We can work with you to produce your card, for what ever purpose, whether it is a loyalty program, Identity card or an RFID card, we can help you obtain a high quality finished product. The reason we are so good to work with is that we are flexible to your requirements and we can offer a speedy production time. Since January 2000, we have secured a large amount of business from major High Street retailers, proving that our reliability, high levels of service and pricing is second to none. Our printing department can offer you a fast turnaround and competitive pricing on prints. Our extensive portfolio covers a whole range of booklets, business cards, leaflets etc. Quality printing at affordable prices comes as standard at our printing department.